A confidently-ridden Lucky Kristale followed up her Newmarket victory in the Connolly's Red Mills Lowther Stakes at York. Carrying a penalty for her success in the Duchess of Cambridge Stakes, George Margarson's 5-2 joint-favourite was held up off the pace by Tom Queally and arrowed down the near-side rail. 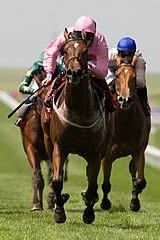 She once again picked up in spectacular fashion and got the measure of Queen Catrine by a length and a half. Queally said: "Fillies with a penalty don't have a great record in this race so it speaks volumes. She's very good. She worked very well during the week and is going places in a hurry." Margarson said: "She'll go straight for the Cheveley Park (Newmarket, September 28) now and we'll worry about next year after that. "Tom said the further they go, the better. She'll get seven furlongs and a mile no problem but we might as well use her speed in the Cheveley Park as long as she's all right after this."